I wasn’t able to run down price or exact availabilty, but this is still quite an interesting looking device, even though it’s not the latest wireless technology. As we can see from the photo above, the business oriented BRT-AC828 sports two WAN and eight LAN Gigabit Ethernet ports. Providing fail-over and enought connectivity that those of us who need a swtich next to the router should give this a once over. It’s also the first router I’m aware of that offers M.2 storage capability on device. Taipei, Taiwan (1st December, 2016) —ASUS today announced BRT-AC828, an ultra-fast AC2600-class dual-band 802.11ac wireless router with a four-transmit, four-receive (4×4) antenna configuration. 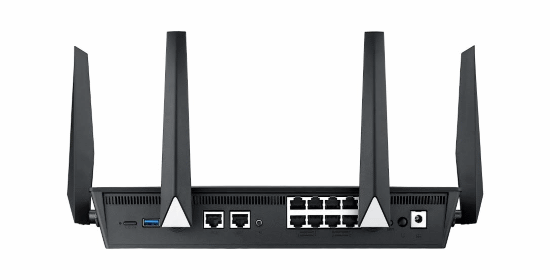 The high-performance, easy-to-use ASUS BRT-AC828 not only allows fast and stable connections to multiple devices, but also offers superb coverage. Even in complex office layouts, the powerful four-transmit, four-receive (4×4) MIMO design with four external antennas and fine-tuned power output ensures optimized reception for the best possible performance. ASUS BRT-AC828 will be available soon in the UK at leading retailers. Please contact your local ASUS representative for further information.